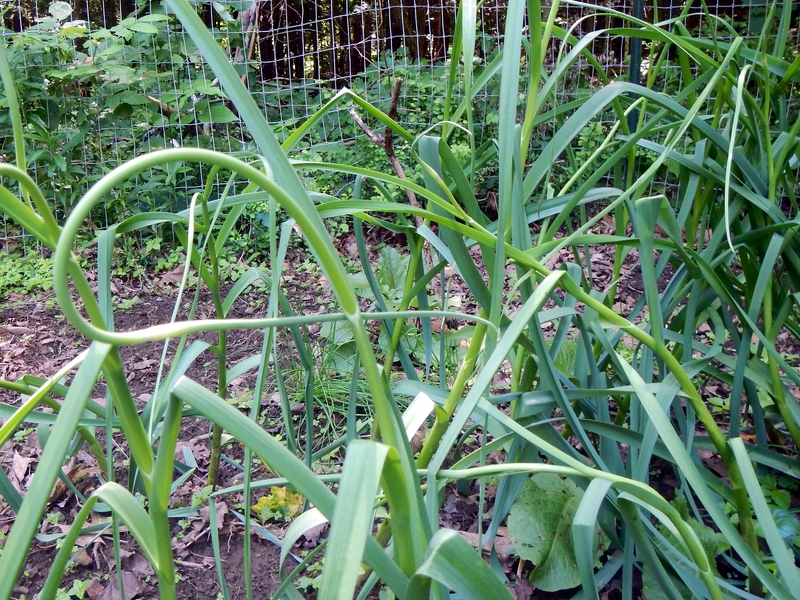 We are finally getting some garlic scapes. The plants seem amazingly happy for how little sun they are getting. Clearing the ‘easy’ part of the garden extension went faster than I expected. So I located the last available seed potatoes within 50 miles and planted 10 lbs of them. The spot is a little shady, but we can still hope for 100 lbs in the fall. They went in faster than I expected as well. The store had 19 lbs left, and we should have bought them all. I also put a couple of pounds of onion sets into a big chunk of last year’s garden. As I mentioned, I’m a bit skeptical that they will bulb well, but Lisa scored a monster freezer on Freecycle, so freezing a bunch of scallions is plausible. Lamb with scallions, Hunan style. Yum. I have to put out a black plastic warning here. It will flap about and likely damage or destroy any plant less than about 4 inches high. 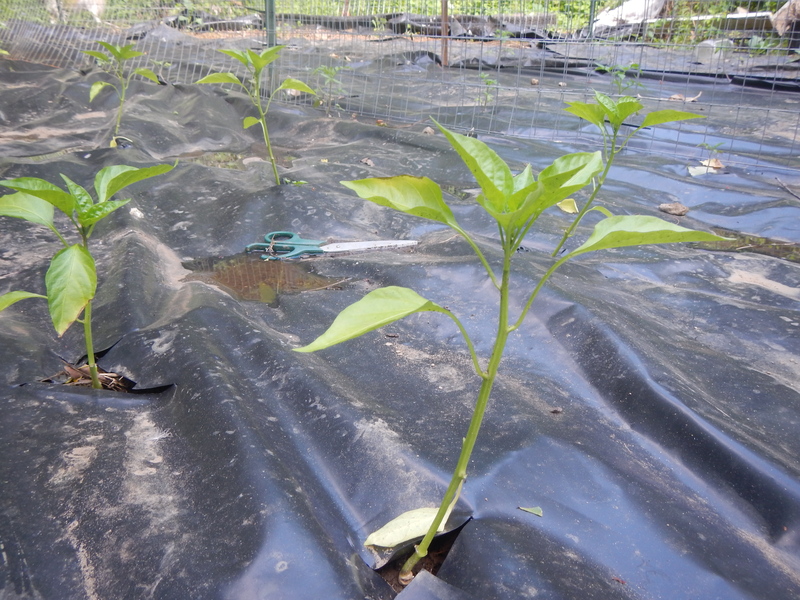 We are down to our last two or three of our pepper plants, and the little darlings are just not growing. We picked up some Anaheim chiles and jalapeños last week too. The herbs are in, but with 20-20 hindsight, I should have put them in window boxes on the porch. More convenient for cooking, and ready to bring in in the fall. There’s only one horehound plant left, which is unfortunate. The stuff is great for asthma. It works almost as well as albuterol, but has no staying power. I can breathe as long as I’m actually sucking on a candy. Then again, Nuts.com will sell you 17 pounds of horehound drops for the price of one albuterol inhaler. We stopped at a farm stand that had locally grown Black Turtle Beans, so of course I bought half a pound to try. Since they were being sold as food, I sprouted them before planting to be sure they were viable. They were. The resident master gardener says that our tomatoes and peppers are suffering from a calcium deficiency. She recommends foliar feeding with eggshell water. I’ll till a serious amendment in this fall. The three year old pelletized carrots and parsnips are germinating very slowly. I saw two carrots today, four weeks after they were planted. I transplanted okra, cucumbers and summer squash today, and planted half a packet of short day onions (Agway should never have carried them in Keene) for scallions. I’m declaring the garden “in”. The bushel a day of bunny food will clear me space for succession plantings. I will now turn my attention to reopening pasture and getting more sun to the garden. Nothing in there actually has enough sun. We are letting the incubator wind down. 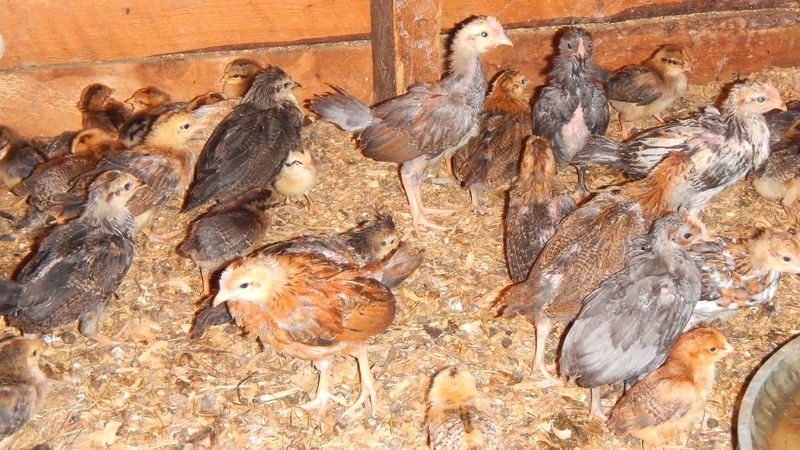 It’s getting to hot to ship — we lost seven chicks in the last batch, and we should have enough babies for all of our pullet orders. We didn’t have the chick demand that we did last year. In part this is good because the late spring really hurt our hatch rate. However, now that we have the brooder room, I’ll discuss hatching waterfowl with Lisa. We know we can sell goslings as well as Christmas goose, and duck if not ducklings. This entry was posted in Beans, Herbs, Irrigation, Onions, Peppers, Planting, Potatoes, Watering, Weeding. Bookmark the permalink. Post a comment or leave a trackback: Trackback URL.